Peter Ward is one of the paleontologists responsible for overturning our understanding of most of the Earth’s mass extinctions, which, long thought to be caused by asteroid impacts, turned out to have been the result of climate change produced by greenhouse gases (all but the one that killed the dinosaurs, anyway). We spoke the day after Donald Trump announced the United States’ withdrawal from the Paris climate accords. Peter Ward: I wrote an op-ed for the Post, I don’t know if they’ll publish it. Probably calling Trump a war criminal was a bit much. Anyway how can I help you? Honestly, what I’d love from you, and what would be most helpful, is if you could first walk me through the analogy you made in that op-ed — exactly how our current situation could lead to the end-Permian Extinction. My own sense in the short run — strangely enough, the most dangerous thing facing us isn’t the extinction scenario, since that’s centuries in the future. What scares me more is the economic effect of simple sea-level rise. CNN did a very interesting article some years ago about how much it would cost to retrofit ports around the world for a six-foot sea-level rise. It’s literally trillions of dollars. Not only docks, but every airport facing the ocean—Sydney, China, San Francisco especially. Secondly there’s the effect on human food. If there’s a six-foot sea-level rise, it’s astonishing how much food will be wiped out — most rice is in low-lying areas, for instance. That’s in the short term — what about the long term? The long term is these greenhouse extinctions are devastating. The most recent one was the Paleocene-Eocene Thermal Maximum, and that was caused almost entirely by methane. So the scariest thing we’re seeing today is the liberation of methane from higher latitudes, and it’s happening far faster than anybody ever predicted. Did you see the news about the Larsen ice shelf? It’s starting to break off. I spent four expeditions down there, just to the north of that, and the amount of retreat is huge. The reason this is important is Antarctica has always been used by the naysayers to say, At least in Antarctica we’re not seeing retreating glaciers. Well, now we are — we really are. And it seems as though the IPCC predictions have been relatively on-target on emissions and warming, that the predictions on ice loss have been far too conservative, and things are happening much faster than anybody expected. Absolutely. One thing about IPCC is that the modelers have yet to figure out how to deal with cloud cover. It’s very difficult to predict. As you’re going to get more water vapor in the atmosphere, you’re obviously going to get more cloud cover. That’s where the models are still breaking down. It will take an enormous amount of mathematical work. And if anything the sea-level estimates have been underestimates. More than anything else, the ice sheets really control our fates — and Greenland, of course. If we melt all the ice, we get at least 140 meters and probably more — Greenland is 15 meters by itself. But one of the scariest places on Earth is right off Namibia. When I give a slideshow on global warming and past extinctions, the killer we’re seeing is hydrogen sulfide. 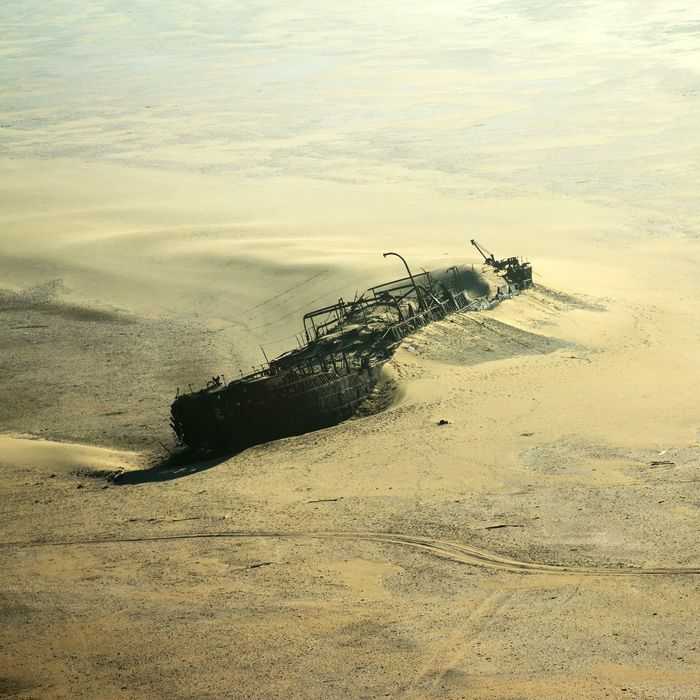 And right now there is something called the Skeleton Coast off Namibia, and the reason is that we’re seeing hydrogen sulfide coming right out of the ocean. The final part of a greenhouse extinction is when that happens worldwide. But the worst place on Earth has to be Bangladesh. They are doomed. And it’s such a densely populated place. Absolutely. As you know, as the sea level rises, it’s like a diving board for storm surge. You’re causing storm surge to jump ever farther inland, and that in itself means huge inundation from storm surge — it doesn’t have to be the rise to destroy the crops. It’s just a bad, bad situation. Well, walk me through some of the other things you’re worrying about. Food seems like one part of the doomsday picture, but what else are you concerned about? I believe that there are going to be some places that become uninhabitable for humans. How big a portion of the world’s surface do you think that kind of effect will hit? Certainly Australia. Australia will be deemed uninhabitable. Already Australia — the outback produces not much in the way of crops. But there are kangaroos. I lived in Adelaide, and I’ve lived through some heat before, but we had 40 degrees centigrade, and 42 and 43 for weeks on end. It really has an effect. You get depressed, you don’t want to go procreate because it’s too damn hot. You just can’t escape it. Everywhere you go on the equator, there is some sort of drug — for the human population to try to get through the day. How do you get through living on the equator? It’s so damn miserable. So I think the equator will become uninhabitable. We don’t do well in heat. In your mind, what is our likely warming ceiling — where do you think we’re heading, and where do you think the range of uncertainty around that is? I’m not a modeler, so I’m not the most prescient to do this, but we certainly could hit 5 degrees centigrade in the next century if we consider the status quo path. Coal is still amazingly cheap. Australia still exports coal. Coal continues to be a major problem. The simple fact is, you have 9 billion people, and the standard of living is increasing, so they’re all going to want automobiles, they’re all going to want steel and iron. And in order to produce that, you need to have sources of energy — huge sources of energy. I don’t see wind turbines powering great steel mills. And as India and China become ever greater consumers of consumer goods, this is what’s going to drive it, I think. To me, it’s been striking how much the green energy sources are growing and how much the prices are falling — much faster than most prognosticators were predicting a few years ago. But it’s also the case that there are all these warming feedback loops that are already in motion. And if some of them get sped up quickly then there’s almost nothing we can do to counteract those effects. You’re absolutely right. I’ve seen something, maybe as much as 10 percent, maybe as much as 15 percent of carbon may be coming from sources we don’t even know about. These methane clathrates may be having a huge significance. They are not being modeled. And we really are going to have unintended consequences and much more rapid heating than even the models say — for the simple reason that the models are highly conservative, too conservative. We’ve talked about food, we’ve talked about flooding and sea-level rise, we’ve talked about direct heat effects. Are there other sorts of broad categories of things you’re worried about? Disease — one of the great killers that people are not recognizing is dengue fever. Malaria gets all the press, HIV of course. But dengue is increasing. The mosquitoes themselves are obviously speciating and becoming ever more immune to pesticides, because we’ve had these jumping genes. What people are not really understanding is that genes can jump from species to species very easily. My 19th book, actually, is called Lamarck’s Revenge, the story of epigenetics. My unique new take is epigenetics in the history of life. The reason we get these outpourings of new body types in the aftermath of mass extinctions is not Darwinian — it’s too slow. Epigenetics occur when there is environmental change. It works for microbes all the way up. And so we can expect much more rapid changes in microbial genetics. I think the mode of evolution is going to switch from this random slow Darwinian to a much more rapid form. And you mentioned a few minutes ago the runaway effects. Can you walk me through exactly what we should be looking out for, most worried about, on that possible track? How does a runaway greenhouse effect get started on this planet? Let’s say we have a deep ocean basin off California and it’s not getting its cold-water oxygen because the surface water isn’t water — warm water holds less oxygen than cold water. So any ocean that is warmer is going to be less oxygenated. And once you switch over to zero oxygen, the microbes that were down there, and the anaerobic microbes start taking over. And as these things take over, you get this black sea effect, and it begins spreading out, and more and more of these microbes start producing hydrogen sulfide. So as it starts spreading, it grows — like cancer. Cancer of the deep ocean. They start spilling over the deep basin and start moving up — that’s called a chemocline. And we’re seeing the first part of this in the Pacific. Are these effects confined to the ocean? Well, hydrogen sulfide does come out of ocean. This is why Namibia is so scary. One of my Ph.D.s just finished his study on sea-grass die-out. We’re losing sea grass globally, and it’s a huge economic blow. And it’s definitely caused by global warming. Why is it important? Because most seafood spends some time, as juveniles, dining on sea grass. An article on sea grass die-out itself would be huge. Tell me about your background and how you came to study mass extinctions generally, but also when you came to think of them in terms of our present day. I was really just a classically trained paleontologist. To me, the mass extinctions were really interesting in terms of what happens after them — we have this dead period, and the recovery fauna is totally different. And that leads to the idea of, Gee, how much longer will the recovery be if we have an extinction now? Impact was key, and king, for the 1980s and 1990s — every one of the big extinctions was attributed to impact. But it became clear that, in fact, no, these were not impact extinctions. We had to invent a new term. I don’t know who came up with it first, but I was in there pretty early calling them greenhouse extinctions. And this new paradigm started coming into play. We’re even starting to see that KT also has a greenhouse component — because there was warming right at the impact. Tell me more about the Permian Extinction, because that’s the most dramatic. I wonder what makes it so exceptional and in what ways we can watch out for our heading down that same path. People always think the intensity of a mass extinction should be related to the extinction — what percentage of creatures were extinct. Increasingly, we’re thinking that’s a metric, but a more important metric that tells you something about the nature of the devastation is how different is the fauna that comes afterward. I think people really don’t appreciate how much, over the coming decades, nature will be at war with the way that we live. Absolutely. Absolutely. Look at the storms that are taking place now. You talk about habitability. I’ve been talking about heat. At what point do hurricanes in the tropics make living there just not worth it? You’re being mowed down by these huge number of tornadoes. Sooner or later people are going to get the hell out of Dodge. But this is the sort of storm ferocity that’s coming. And we’re sort of used to the idea that parts of the world are more prone to things like hurricanes, as part of the cost of living in the Caribbean or whatever. But it seems like those events are going to become much more common still in those areas, but there are also events that are going to become much more common in all the areas where one might flee to from there. So there’s a risk of our running out of safe spaces — nothing is going to be protected from extreme weather. The best case to look at is in the Philippines. That last couple of typhoons they’ve had — the ferocity and the increase in those things that’s been happening. That’s the model for what’s coming. It isn’t anything [like that] in the Caribbean; as brutal as those hurricanes can be, they have nothing on these typhoons. Looking at recent weather history, are there things that stand out as harbingers? Well, with the warming you get less and less snowfall in the winter. And one of the areas that’s really being hit hardest right now are the low countries of Europe. Because the Alps used to get all this snow. People think the Dutch worry most about the dikes and the floods. But no longer. The Alps are having ever lower snowfall, and you get these enormous storms, so we’re getting an increasing rainfall, and that in itself is a gigantic human problem. Obviously floods — the increased flooding caused by ever more water in the atmosphere is going to be really as bad as storms. We’ll get these floods all over the planet. And the problem is twofold: They kill people, but they also wash away the soil. One thing we haven’t really talked about is fresh water and the coming threat there — the water scarcity threat. Absolutely. I really do think we’re going to see … The flash points appear, to me, to be China, India, and Pakistan fighting over the water coming from the Himalayas. Water will be the great fight. Water and food will be the two things that the 21st century will fight over. How do you see those fights playing out? Tunisia used to be the granary of Rome — Carthage kept Rome going! I’ve been to Tunisia, and boy you don’t see much wheat there anymore. You see the Sahara moving ever farther north, and reducing crop yields, just as human population is increasing there. Yeah, it is. We need to slow human population growth. But our White House is doing everything it can to make sure climate change happens. It’s strange I have a longing for the Bush years — I thought nothing could be worse, but now those are the good old days! The places that are going to be hit hardest by climate change are the places where his voters are — the Midwest, the Dust Bowl states. Which means the anger that elected him is going to continue. Big-picture question: A while ago, Stephen Hawking made some headlines by saying that in order for humanity to survive we had to figure out a way to colonize at least one planet within 100 years. How reasonable do you find that kind of warning, or how insanely alarmist? Well, he may be the smartest guy on the planet, but boy, I just think this is inane. My sense of it is, with our technology, we’re just too good, we can engineer and keep some part of us alive on Earth. The only way out of it would be a wholesale nuclear exchange. But barring that, a greenhouse world won’t kill us all off. If worse comes to worst, we’ll have gas masks. But what I would advocate is — just like that seed vault, in Norway, that there should be hundreds of thousands of frozen eggs, human eggs, that are taken off-planet. This could just be an orbiting facility carrying seed stock itself. But colonizing Mars? Why? There’s lots of areas that would be easier to put a dome over on Earth than it would be on Mars, because at least you can breathe the air. That alone! Humans will never be able to send off a colony, a breeding colony, to another star system. The only way you could do this is to send fertilized eggs. But one possibility is we are stuck here. And if you look at the Fermi paradox, it could be that lots of organisms are stuck on their planets because the galaxy has not been colonized. I’ve been doing these web talks with NASA people. One of the really interesting concepts around the Fermi paradox is the Great Filter — that civilizations rise, but there’s an environmental filter that causes them to die off again, and disappear fairly quickly. If you look at planet Earth, the filtering we’ve had has been in these mass extinctions. I think that’s about it from me. Thank you. It’s been a fun talk. Go get ’em, man. We need people out there like you. I mean it. Though you’re not going to get thanked for it, you know.